CIOReview publication draws attention towards the leading companies and revolutionists that are substantiated on their unprecedented level of performance, ability of creating remarkable customer experience and producing more far-reaching positive impacts in harnessing future gains. 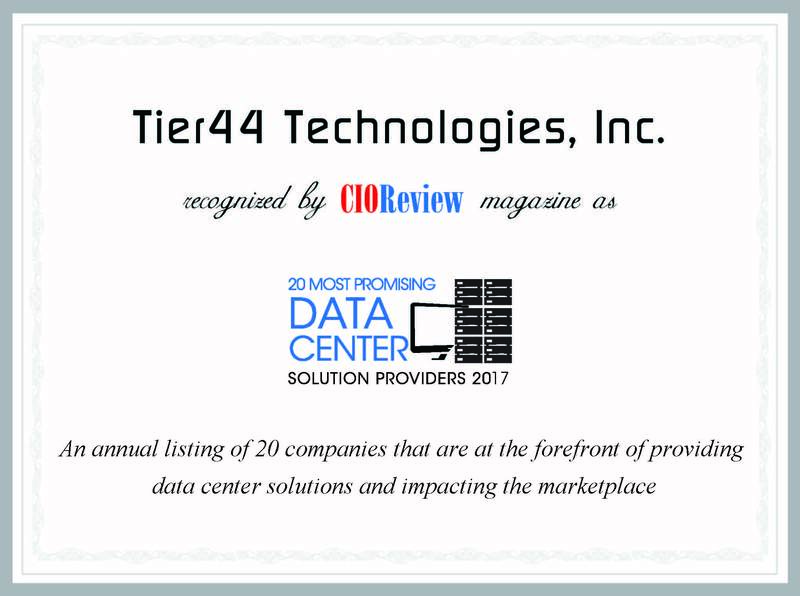 Santa Clara, CA, April 13, 2017	(Newswire.com) - Tier44 Technologies, a leading Data Center Management solutions provider, has been selected as one of the Top 20 Data Center Solution Providers of 2017 by CIOReview magazine. CIOReview chose Tier44 based on its capabilities in providing Tier44 EM/8—a holistic Data Center management Solution available in the market today. 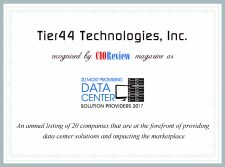 Tier44 is a certified data center management provider for ServiceNow. Through ServiceNow’s configuration, incident and workflow management, enhanced with equipment reference details, monitoring capacity and runbook automation, Tier44 has succeeded in providing the most comprehensive data center management solution available today. Integrating with both, facility and IT components, Tier44 is the only DCIM vendor natively using the ServiceNow CMDB as a single place for all configurations. There is no parallel CMDB, no double data entry, and no reason to access two distinct applications. “We are very excited about this recognition and want to thank CIOReview and its readers. This validates innovation we provide for ServiceNow users by helping them with their day to day challenges of managing critical infrastructure" said Clemens Pfeiffer, President and CEO of Tier44 Technologies. To read the full article, please visit CIOReview here. Tier44 will showcase its award winning solution at Knowledge17, the annual ServiceNow user conference in Orlando, Florida from May 7th - 11th, 2017. Please visit our booth for a live demonstration. Alongside this study, each year CIOReview carries out additional research to expose what makes these companies so successful in today’s market. The magazine features Senior Executives, CEO’s and Professionals of leading organizations, who participate in each year’s Most Promising Companies rankings to share their viewpoints on a wide range of business priorities, technologies and practices.